Why is 3D Printing and Design Important? 3D Printing & Design is one of a small number of technologies which countries around the world have identified as necessary during the next generation. Our country and each person in our country is in direct competition with individuals in other countries. We have to master these technologies to stay competitive. Like most emerging technologies today, 3D Printing & Design is “multidisciplinary. ;” electronics combined with engineering, biology, chemistry and physics, etc. This is Robotics combined with Material Science and Biology. A disruptive technology is one that displaces an established technology and shakes up the industry or a ground-breaking product that creates a completely new industry. Examples are electric light, automobile, personal computer, Windows, email, social media. Visit thingiverse.com and see what others have made. Download a few of your favorites. 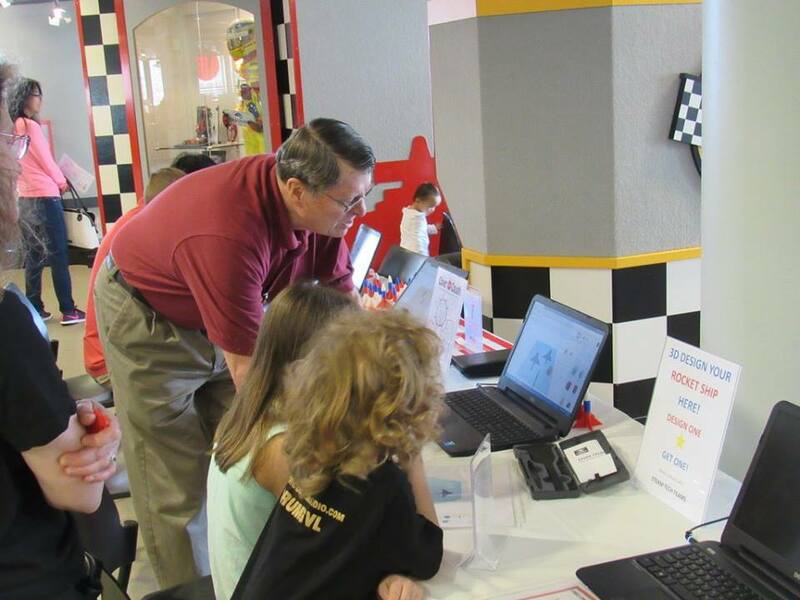 Here is Mr. Becker working with children at the STEMfest at Children's Museum in Greenville. We assist teachers and administrators to establish 3D printing and 3D design programs in their classrooms. These concepts and processes can be applied to students who want to explore Art as well as Engineering. We help teachers and their students to size, print and assemble simple prosthetic hands designed by E-Nable, an Internet-based worldwide volunteer organization. E-Nable provides prosthetic hands free of charge to people around the world who are without hands due to birth anomalies, accident or war. Visit enablingthefugure.org to learn more and donate to this important cause. Why should you care about 3D printing? Teachers, parents and students need to be aware that there are thousands of jobs that the students could be working in that use 3D printing. They need to be prepared to meet the challenges of these jobs. Students interactions could be with hardware, software, design and, innovation.